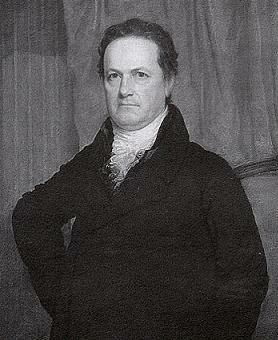 DeWitt Clinton (1769-1828) Mayor, Governor, founding father of the Erie Canal, and avatar for Mr. D's Neighborhood. A few folks in the Neighborhood ask occasionally about my avatar. Who is that dignified gentleman sitting next to your URL? It’s far too proper for a blog this profane. Today we give my avatar its due. The dude in the little square on your browser is DeWitt Clinton, a New York politician described once by Columbia professor Kenneth Jackson as “probably the single most important person to ever live in the city of New York.” His achievements helped shape the modern city: the numbered streets, our school system, the development of public museums and civil services. Yet his greatest opus was a 363-mile ditch–a ditch that changed America forever. On October 26, 1825, after 8 years of work, the Erie Canal was finally completed. Clinton was the mastermind of the canal, pushing for its construction long before funds were earmarked and work began in 1817. This huge artificial river spanned across New York State, making New York City the funnel through which all the resources–and products–of the middle West could pass through to Europe and beyond. From then on, New York would begin a century and a half of almost unstoppable growth, becoming the biggest city in the United States. It also changed the state itself. Today 80% of the New York State’s population live along the path of the canal, either along the canal itself or along the Hudson towards New York City. Looking at a map, one can see the accumulation of highways, airports, and metropolitan areas all along this early trade route. It was this ditch, this “insanity” of a project (in Thomas Jefferson’s words) that created the modern state. Finally, the Erie Canal proved how business and government could work together to create great public works for the good of all. In our partisan politics, our crumbling infrastructure and our increasing resentment of the perceived power of our government, it is important to note this incredible event in history, when Americans could put partisanship aside to do monumental things. Here’s a Powerpoint unit presentation on The Erie Canal that I designed. It includes essential questions, activities, interesting primary quotes and culminating projects. Feel free to use in your classrooms. Just make sure you credit the Neighborhood for your fine resources.